We place a high priority on our children's ministry. A lot of thought and love has been put into their curriculum and activities. With our preschool children we focus on providing a strong base/introduction of the “big” stories throughout the entire bible while focusing on God’s love. As they graduate into 1st & 2nd grade they will begin exploring scripture chronologically and teaching kids to see the whole bible and how God’s big story connects to their own. 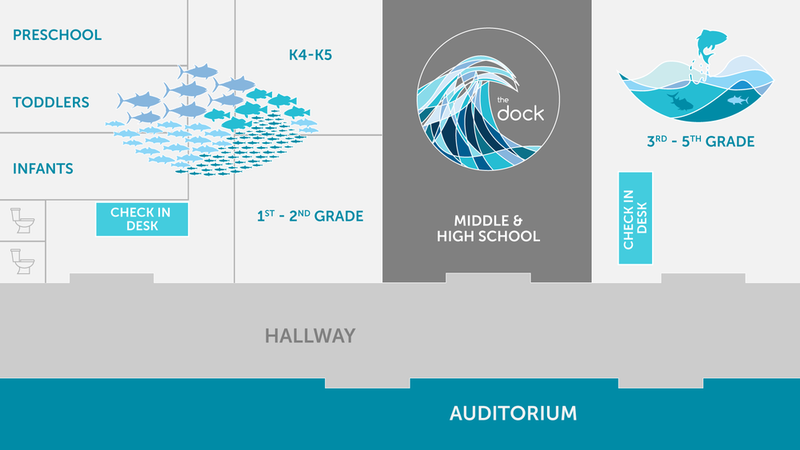 In the 3rd – 5th grade class we encourage spiritual growth, while allowing time for kids to respond to God through the power of the Holy Spirit. When you walk into the church you will see our lobby and coffee counter. When you go past the lobby you will enter into a hallway. On the left is the auditorium where the main service will take place. On the right are the different kid's classrooms. 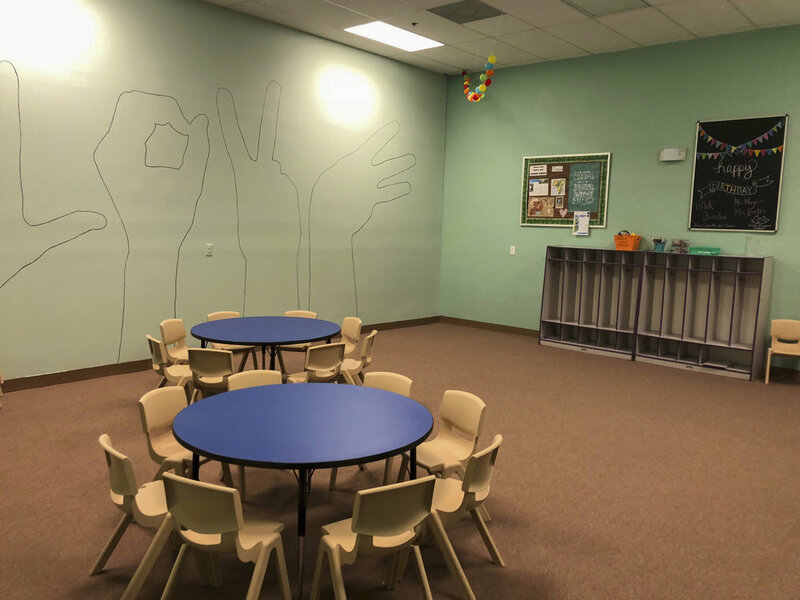 The Vineyard Preschool Infants room creates a comfortable and nurturing environment for newborns up until they are stable walkers. Our volunteers gently care for these newest members/visitors, pray for them, and spend time getting to know them as they grow. For more information email Cheryl Abbott here. Children move up to the Vineyard Preschool Toddler room once they are stable walkers, joining our other one-and-two-year-old children. Here they begin learning a simplified curriculum focused on the “big” bible stories, such as Noah’s ark, Jonah and the whale, Adam & Eve, etc. Volunteers spend time praying with the children, leading them in worship songs, weaving the main lesson for the day into playtime, and teaching them the bible story during snack time. Children 3 years old and 4 year olds who do not yet qualify for VPK4 (turning 4 after September 1st) gather together in the Vineyard Preschool room. This room is full of energy and fun as they begin developing friendships and learn to share with others. Volunteers teach an age-appropriate lesson each Sunday that includes craft projects, bible stories, prayer, games, and worship. “Little Son Catchers” is a Vineyard-based curriculum focusing on God’s love, creation, worship, and Kingdom values. Those who qualify for VPK4 (turning 4 before September 1st) and kindergartners join together in the Vineyard Preschool K4/K5 room. Here they dive deeper as they continue learning the “Little Son Catchers” lessons, a Vineyard-based curriculum focusing on God’s love, creation, worship, and Kingdom values. The curriculum takes our children through the entire bible in three years, providing a strong base for their continued relationship development with God. Because we tailor this curriculum on a 3-year rotation, children experience a new lesson each Sunday from the time they are introduced in the preschool room until they graduate up to the 1st & 2nd grade room. The 1st and 2nd graders spend Sunday mornings getting to know Jesus and each other through lessons, activities, and worship. We follow the Tru curriculum through the Old and New testaments. Volunteers provide a fun, safe environment for our students to be themselves, ask questions, and learn about Jesus. For more information email Carolyn Valeria here. In the 3rd-5th grade room, the older elementary children will be invited to answer the call to a deeper relationship and understanding of who God is and how much He loves them. Through the Imaginative Prayer Curriculum we will take time to hear from God as our loving volunteers read passages of prayer from the book. Through games, journals, Bible studies and open discussions we encourage them to learn about God in a loving way so they fully understand their heritage as His children. For more information email Cassidee & Dustin Drake here.